Rural perimeters of the Island are high density areas for ticks. 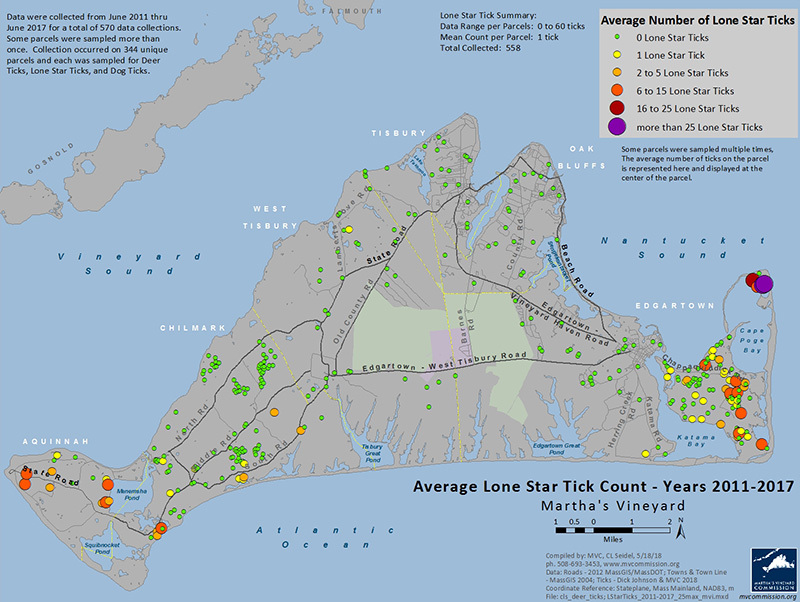 When it comes to field work and education, the Islandwide tick-borne illness reduction initiative has gained a solid foothold this summer, but the documented spread of lone star ticks poses ongoing concern, the Island biologist leading the program said. “We’re finding them in more places and in the places we’re finding them, we’re finding more of them,” said Richard Johnson, speaking of the relatively new tick species that he said has now advanced inland from the remote perimeters of Aquinnah and Chappaquiddick. More aggressive than other ticks and much less understood in the context of Island ecology, lone star ticks inflict a painful bite and some carry a bacterial illness called spotted fever. 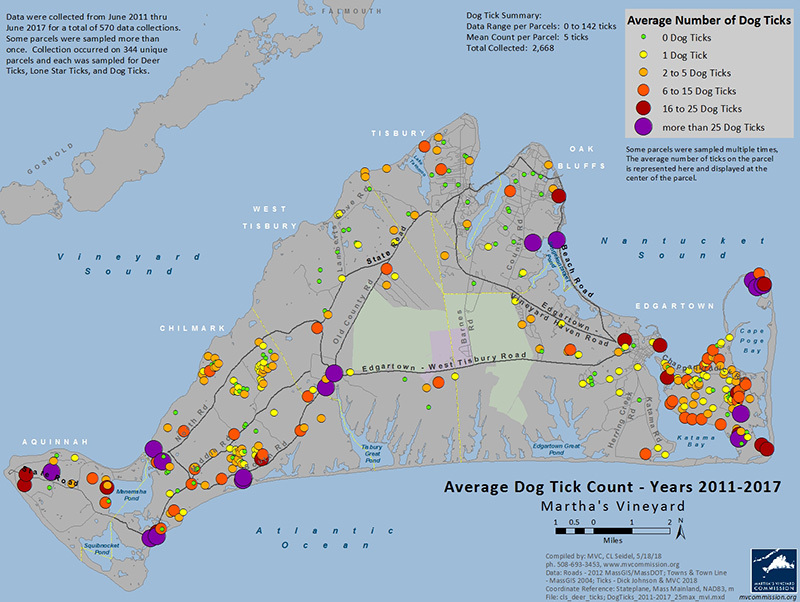 New maps prepared by Martha’s Vineyard Commission cartographer Chris Seidel and released this summer document the spread of deer ticks, dog ticks and lone star ticks. 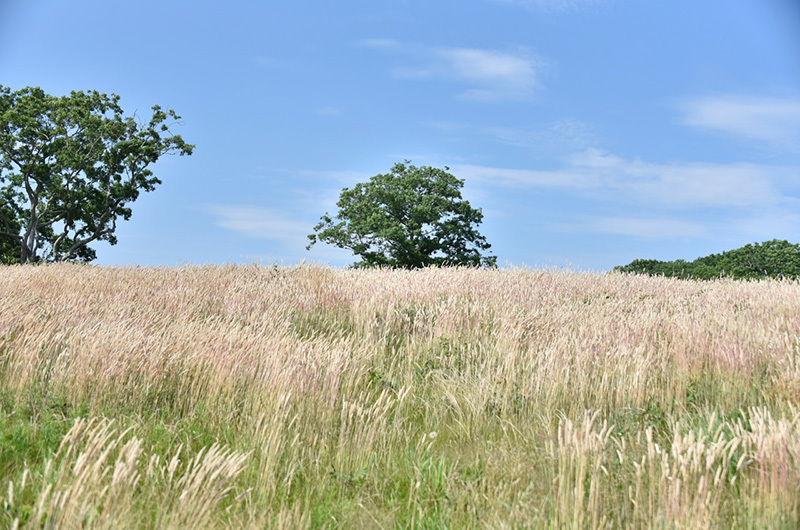 All carry bacterial diseases, including Lyme disease, erlichiosis, babesiosis and tularemia, and pose a major threat to public health on the Vineyard. Dots on the maps represent 570 tick data collection visits to properties Islandwide made by Mr. Johnson from 2011 to 2017. Larger dots represent a higher average number of ticks found on the parcel after multiple visits. This is the second year for the tick maps. Ms. Seidel said the maps also now depict areas where no ticks were found. “There’s definite value in knowing where there’s nothing,” she said. 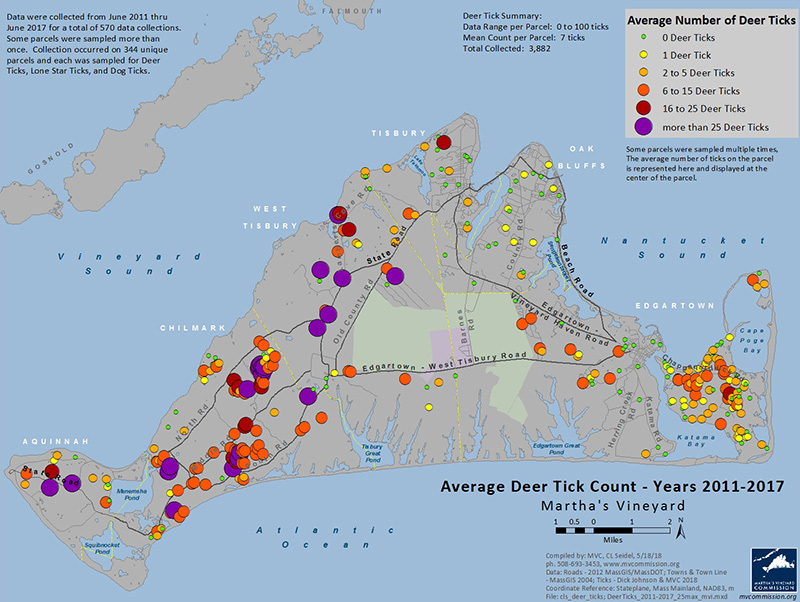 Low density areas for ticks include Vineyard Haven and Oak Bluffs, where conditions are generally drier, Mr. Johnson said. High density areas include Chappaquiddick, Aquinnah, Chilmark, West Tisbury and Katama. Moisture, shade and leaf litter all provide favorable conditions for ticks. Mr. Johnson said he and his two interns have been busy this summer with the meat and potatoes of the program: yard surveys for homeowners. The surveys involve sweeping yards to collect ticks using a simple method, and then advising homeowners about steps to take to reduce or eliminate the presence of ticks in their yards. More than 200 surveys have been done this summer, well up from last year. The surveys are done for a modest donation (the tick-borne illness reduction program runs entirely on donations). Homeowners can sign up online to have a survey done. Meanwhile, education remains ongoing through community talks at Island libraries and other venues such as annual meetings for homeowner associations. Mr. Johnson also said administrative changes put in place earlier this year for the program have been a positive. The program now operates under the auspices of Dukes County, although the Permanent Endowment for Martha’s Vineyard still acts as a pass-through for the tax-deductible funds that make up the annual budget of about $60,000. The summer intern program is a first and one Mr. Johnson hopes to continue, if the program can sustain itself. “We have no money for next year,” he said, noting that the program currently has enough money to run through October. He said he plans to begin fundraising efforts before the end of the summer. And he plans to redouble efforts in the fall to encourage more deer hunting. Efforts to increase the deer take have seen slow but steady progress through a variety of initiatives in the past two years, including opening up more private land for hunting and a community venison distribution program. A statewide initiative to extend the archery season this year for deer will also help, Mr. Johnson said. Deer are a key factor in the life cycle of ticks since they host the organisms during their reproductive phase. Ticks are arachnids and feed on the blood of mammals, birds and sometimes reptiles. Looking ahead, Mr. Johnson said he believes a major ecology study will be needed to better understand the life cycle and habitat factors around lone star ticks. He said the work could possibly be done by a graduate or post-graduate student. “This is not the work we have been doing, but I think it will need to be done in a next phase — probably not by me — and that’s a big step,” the longtime Island biologist said. Tax deductible donations to the tick-borne illness reduction initiative can be sent to Richard Johnson, 10 Tori Lane, Vineyard Haven, MA 02568. To sign up for a yard survey, visit surveymonkey.com/r/K53GTY3. I understand that brush cutting around homes is a good way to reduce tick population. The request form for tick survey seems to assume everyone has a caretaker. There are numerous elderly year round homeowners on the island who cannot afford caretaker service, and who struggle with keeping vegetation under control because of physical limitations. Perhaps a group of volunteer grass & brush cutters could be available to help these folks...either free or for a token fee? This would help them, as well as the community as a whole. MVRHS students...an idea for you to do community service? Great study. We need more of this kind of data to drum up funds and actions to counter this. Not sure why Chappaquiddick is singled out. It has the most samples but far lower count results than most of the rest of the Vineyard. Extending the deer hunting season, well into the winter, would be a significant help. Maybe the island can provide a pamphlet explaining how to protect against ticks and fleas for visitors to the island. Great idea! And place them at the ferries, airport, hiking trail heads and hospital. There needs to be an island-wide program that involves significantly reducing the deer population, tick tubes, and other tick elimination methods. One-off or leaving it up to individuals will never solve the problem. We chose not to return to the vineyard this summer, partially because of the tick problem last year. Staying in Katama, our dog would be covered with literally dozens of ticks after every walk. I had never experienced such a bad tick problem. We spend hours a day checking him and plucking ticks from between his toes and over his body. Lucky they are easy to spot on a short haired dog, but it was still unpleasant and jarring to have so many ticks. I don't know if the Vineyard is a natural habitat for possum but if so, maybe more could be imported. They are non-aggressive, do not carry disease and eat 100's of ticks a day. There no opossums on Martha's Vineyard. Please, keep it that way! The last thing the Vineyard needs is another invasive species. Incorrect, Ive seen a possum on my hunting camera. We have found that weekly lawn mowing and brush cutting, has greatly reduced the number of ticks on our property and dog. We have also combined the Seresto collar and monthly administration of Nexgard. The combination of these two agents have been an effective way to control the number of ticks we have found on our dog. Most, if not all, of the ticks we have found, have either been just on his fur, or dead. One big help would be a year round open season on deer. Besides millions of ticks on the deer, there are way too many deer in the first place. And for those who think deer hunting is cruel, it's more humane to shoot a deer that can't get enough to eat in the winter because there are too many looking for the same food, than to watch them starve to death. And where do people who like a nice fat steak think that steak came from, someone had to kill a cow. Somebody with common sense. Thank you . It's obvious not so common. Can we throw the rabbits n skunks in there too ?? Been a summer visitor since 1965. Back then the dog ticks were Absurd! Now own a house on Quansoo near the beach. Property covered in oaks but zero ticks: neither dog ticks nor deer ticks. Yes we mow the 3 acres but if my dogs get loose they boot it after deer, of which I have far too many but I can't find anyone to hunt! Dogs are vaccinated but I had minimal poison on them. What's up with that? Lest you begin lecturing me I have a degree in Zoology with a minor in Entomology. Way too many rabbits far too many deer,fewer skunks by far. Confused on Quansoo.